Whether you love them or hate them, the Kardashians are unavoidable, and to be honest, their rise to pseudo American/Armenian royalty is interesting and confusing. It took me a very long time to figure out which was Kendall and which was Kylie, which sister was beefing with which B-list celebrity and what relationship was still on or still definitely off. 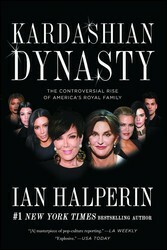 Luckily, Ian Halperin has just released Kardashian Dynasty, which addresses these questions as well as some of their more controversial power moves. Here’s a quick status update–the Kliff Notes, if you will–of each Kardashian so that you’re up to date for when KUWTK comes back on E! this Sunday. Besties with Gigi Hadid and the other tall model with a K… (thinking…) Karlie! Caitlyn Jenner – is still being Cait and a Republican. Does anyone even watch that show anymore? Recently the big news has been Rob, the only son, dating Blac Chyna. Luckily The Levine Machine @Eitanthegoalie has broken down what would happen if Rob and Blac Chyna were married AND Kylie and Tyga were married. Thanks for this amazing graphic breakdown! Thank you to The Levine Machine @Eitanthegoalie for this amazing breakdown! For more dishy secrets on the Kardashians, make sure to check out Kardashian Dynasty. #1 New York Times bestselling author and investigator Ian Halperin pulls back the curtain on America’s notorious Kardashian family—exposing their shaky foundation for fame—one shocking revelation at a time.